Following up on my previous post on using various tools to try to find a book published in the 1800s, I thought I would try a similar experiment and try another known-item search, this time to find a book that we have at the Library but that is not in the public domain. I had to try a few titles before I hit upon one: Lave and Wenger’s Situated Learning: Legitimate peripheral participation, published in 1991. 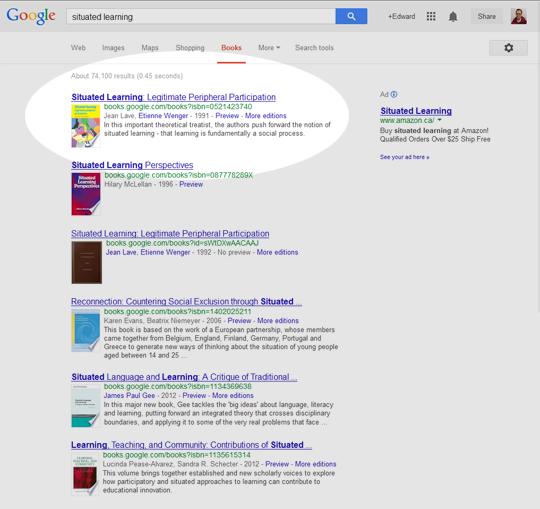 Again, I’ll start with a basic search in WorldCat, searching for “situated learning.” The book I’m looking for comes up second in the list. Clicking through to the details page, I see that we have three copies at the Library, but that none of them are available (two are out on loan and one copy is missing). I could click on the Request button here which would allow me to have the book recalled, which means that one of the people would get an email notice to return the book within a week or two instead of the original due date. If the book was on the shelf, I would be able to retrieve it myself by noting the location (branch) and the call number, and then going to the branch and using the signage there to make my way to the book. Alternately, I could click on the Request button to have the book retrieved from the shelf and delivered to the branch of my choice. That process takes a bit longer (a day or two) but saves me from having to hunt for the book. It all depends on how urgently I need the book. Repeating the same search in the Classic Catalogue, the book I’m interested in is at the bottom of the first page of results. Here again I can see that we have three copies. While I know from experience that students are not always able at first to understand the information here to figure out if the book is available. 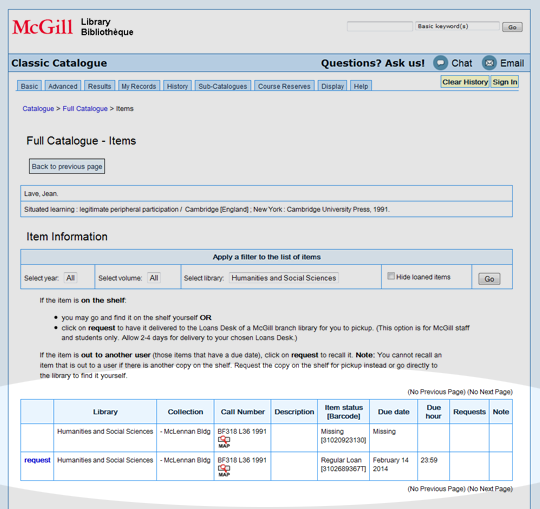 For a student or user who knows how to use the Catalogue, though, it is fairly straightforward. To access the recall/request functionality, I need to click on the location/holdings information. 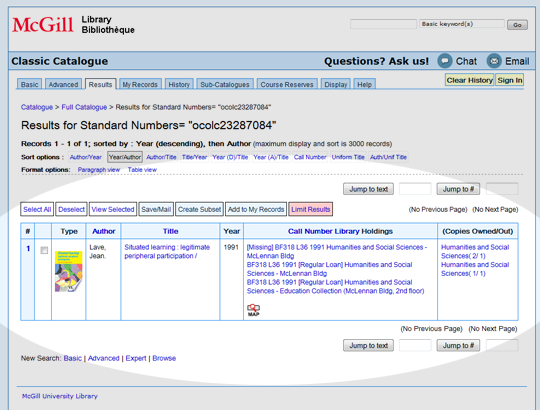 Once advantage the Classic Catalogue has is that there is a Map icon that users can click on to see an interactive map that shows exactly where the book is located in that Library branch. 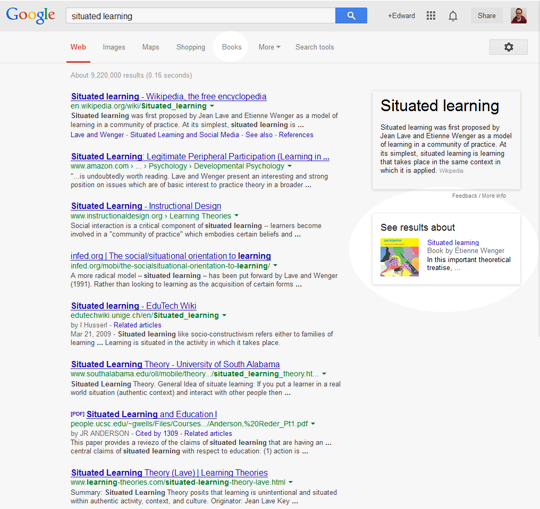 Now, if I search for ‘situated learning’ in Google, unsurprisingly all the results are pointing to information on the topic of situation learning, and not the book of that title. Here, I have an online preview of the book, which is not the full book, but could still do in a pinch depending on what you are looking for. But let’s say I want the book. Well, Google was good enough to put a big, red GET PRINT BOOK button on the page, so let’s assume that most people are going to click that. So I have a list of places where I can purchase a copy of the book, along with the price at each for comparison. Better yet, there is a link above this list that says “Find in a library”. Clicking that takes us to the WorldCat page for the item. Actually, since I am currently on the McGill network, WorldCat detected that I was on the McGill network and offered to redirect me to the McGill-localized version of WorldCat, but I declined since I wanted to consider a ‘worst-case’ scenario where the patron was from McGill but not necessarily on the McGill network (i.e. not physically on campus or connecting through VPN). 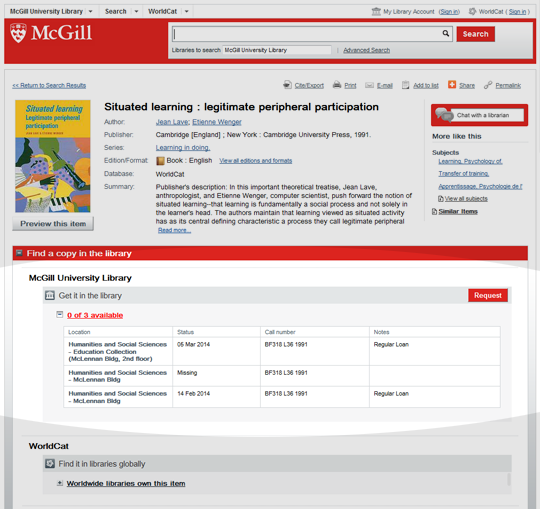 And although this is the generic WorldCat UI you can see that it provides a note that I am on the McGill Network and gives me links to McGill services that interlibrary loan as well as a link the book’s page in WorldCat Local (WCL) instance. 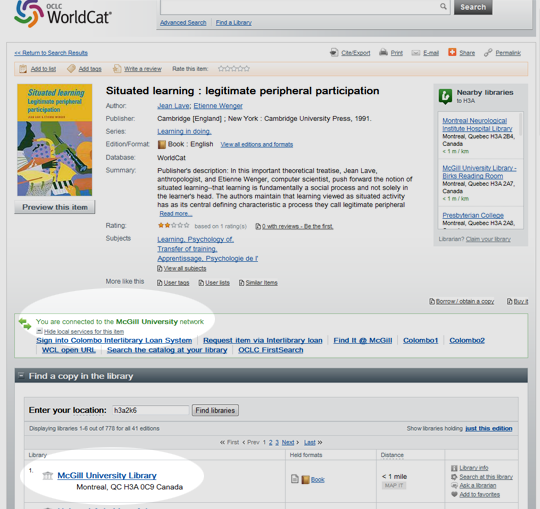 The WorldCat page (above) gives me a list of libraries that have copies of the book. The page appears to be location-aware: there is a postal code entered in the location box that isn’t my postal code, so I’m assuming it was provided by Google or by my browser… or maybe it is WorldCat that is somehow doing the lookup? 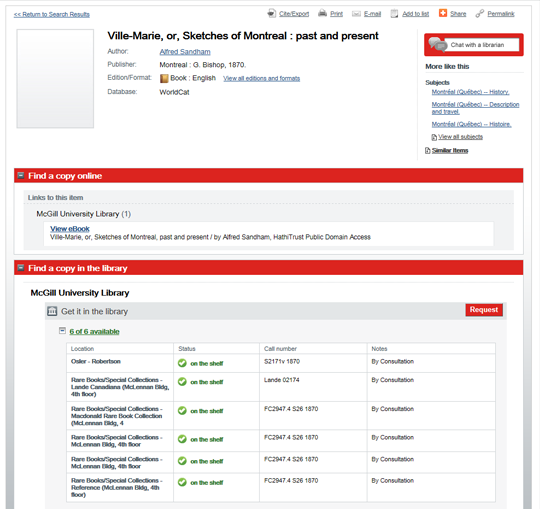 I’d need to do more research to figure out how my location is being determined, but at the moment all that is important is that I have a list of libraries that have the book and McGill is at the top of that list. 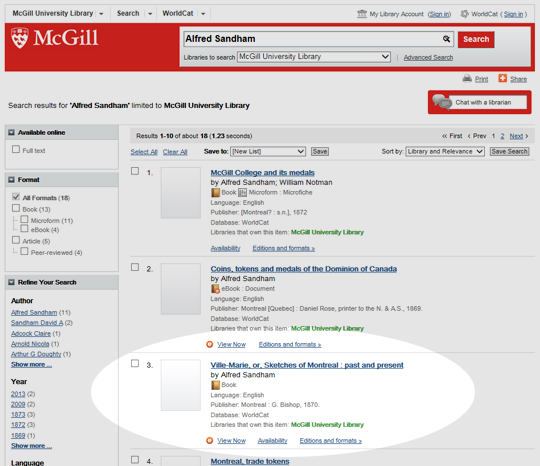 Clicking on McGill University I’m taken to the Catalogue entry for the book, with all the benefits and potential confusion that that entails. Still, you can see that here again Google works just fine for a known-item search, even if that item is a book only available in print format at the Library. I didn’t try this last time, but let me see what happens when I use the Books facet in Google to find Ville-Marie, the Alfred Sandham book I was looking for last time. 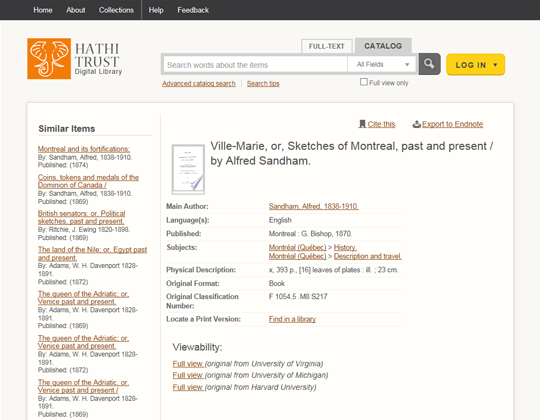 Searching again on ‘alfred sandham’ then clicking on books, Ville-Marie is second in the list. 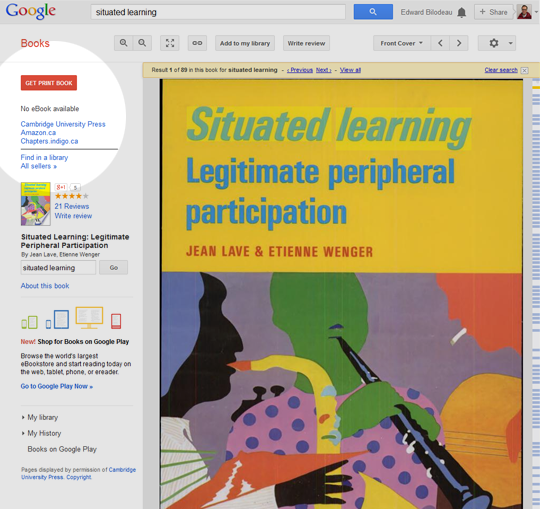 Clicking through, I’m taken to the same book display as we saw with Situated Learning. The difference here is that since this book has been digitized and is in the public domain I can flip through it right there on the page or I can again click the big, red READ EBOOK button in the upper left-hand corner of the page to download a PDF or EPUB version of the book. Actually, you see these options if you hover over the button. If you click the button the book gets added to your Books on Google Play. You can easily read the book on the screen, and if you click on My Books to get back to your list of all books, you can use the context menu on the each book cover to download PDF or EPUB versions. However, if you have the Google Books app installed on your tablet or phone, the book you’ve added will show up there and with one more click to download you can read it. 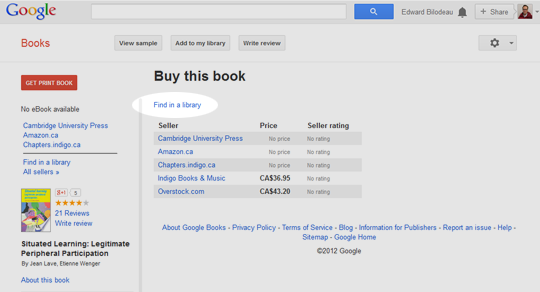 So for public domain ebooks, the known item search in Google is pretty slick. 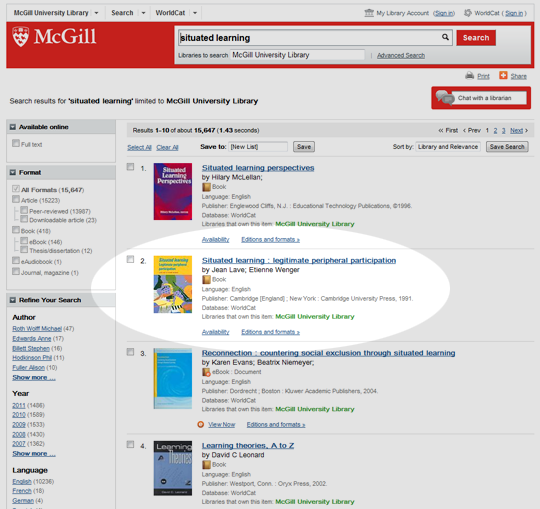 Now that I’ve tried looking for books in the public domain ebooks and now print books, next I will turn my attention to searching for restricted ebooks, that is, ebooks that the Library pays for and that can only be accessed by members of the McGill community. …but that will have to wait for the next post! This past weekend I was reading a book on the history and architecture of Old Montreal, and I came across a reference to a Alfred Sandham, a Montrealer who wrote about life in the young city in the mid- to late-nineteenth century. According to the book I was reading, Sandham’s most well-known work was Ville-Marie, or, Sketches of Montreal : past and present, which was published in 1870. Interested, I thought I would see if we had a copy at the Library. I picked up my tablet, navigated to the Library home page, and typed “Alfred Sandham” in the search box that appears there. That search box searches against our WorldCat Local discovery layer, and I was interested in seeing how well it handled my search. 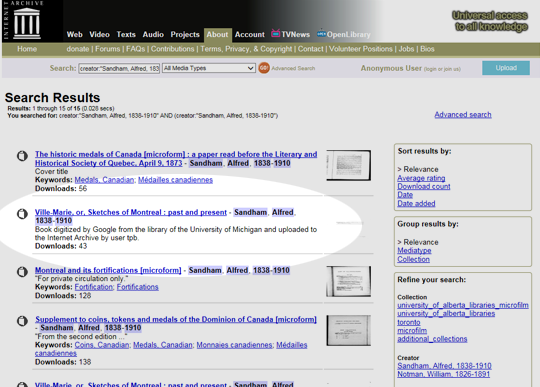 As it turns out, Ville-Marie showed up third in the list of search results that were displayed. I was expecting to have to filter by type or redo the search as a title search, but the author name appeared to be enough to pull up what I was looking for. I clicked on the record to see how I could get my hands on the book. 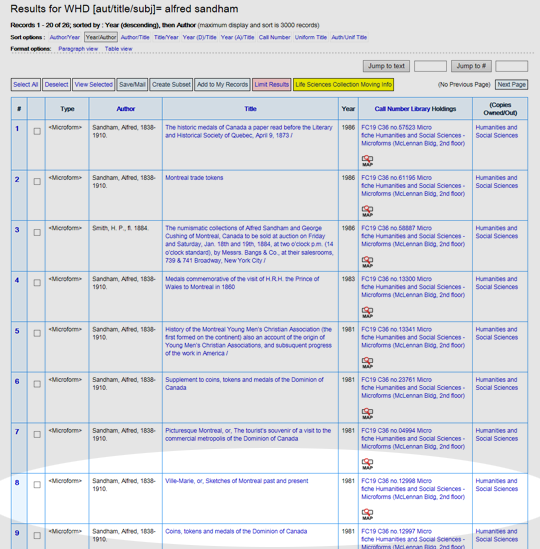 As you can see, the WorldCat record shows that we have several copies of the work, but all of them in our rare collections and available for in-library consultation only. If this book was central to research I was doing, and if I was looking for a reason to spend a few hours nestled amongst our finest books, this would have been enough for me. However, my interest is more personal and my time too limited. I was hoping to have a copy I could take out and browse when I had a spare moment here and there. Fortunately, I noticed that under Find a copy online, there is a link to an online version of the book that we have access to through Hathi Trust. According to the “viewability” section of the Hathi record, there are three digitized copies of the work: one from the University of Virginia, one from the University of Michigan, and one from Harvard University. 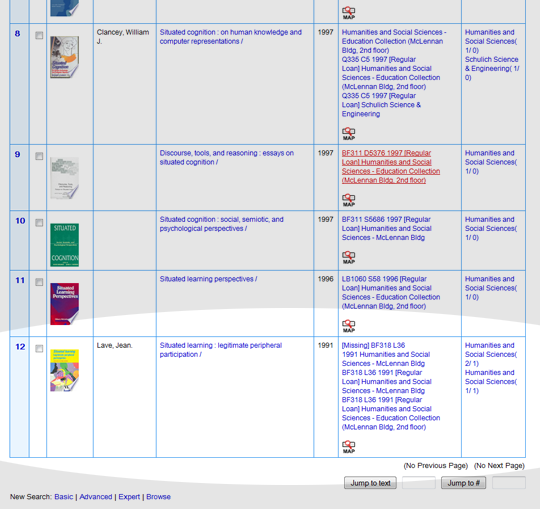 Clicking on any one of these brings be to the digitized copy of the book displayed in page. 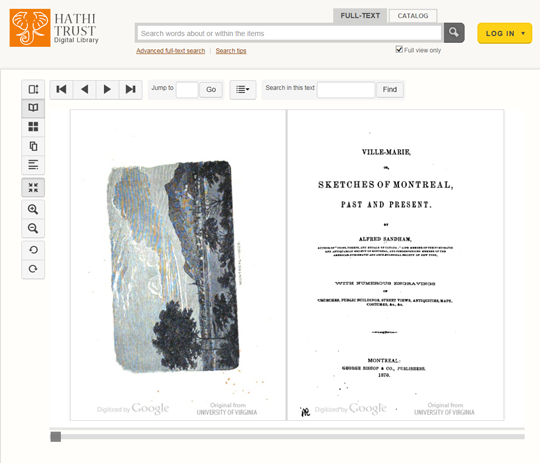 Note that if I login to Hathi Trust (using my McGill username and password, thank you shibboleth! ), I can also download the full PDF of the book if I so desire. I thought I would compare this search experience with what would have happened had I searched for the item in our Classic Catalogue. So, the Classic Catalogue. 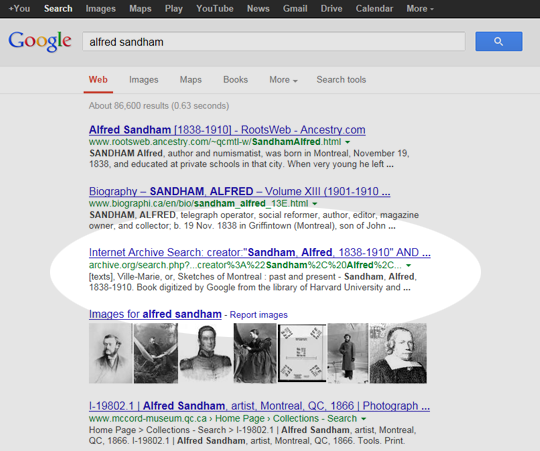 I go to the default search box and type in “alfred sandham”. 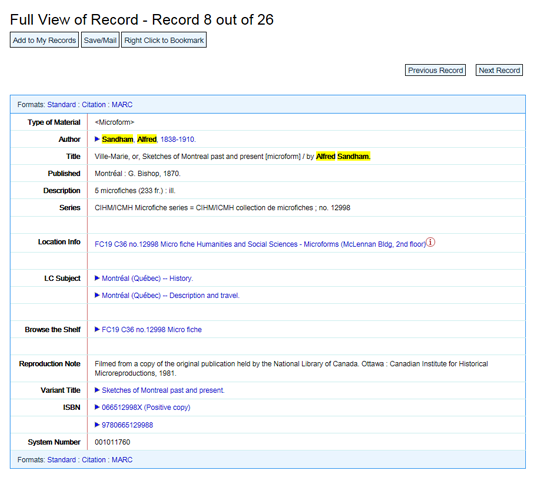 The first entry for Ville-Marie is eighth in the list, but it says “microform” next to it. I click through anyway, but I only see more information about microfiche, and nothing about print or electronic copies that might be available. Let’s assume that I know what microform/fiche means, and I also decide that there must be a print copy at the Library, and that I just haven’t found it yet. I go back to the search results and keep scanning. Nothing else on page one, so I go to page two of the results. There I see that there are print copies available, but they are by consultation only. No mention of an electronic version anywhere. As I said before, the are certain situations where a patron will make the effort to visit Rare Books and Special Collections (or Osler) and sit and read the book on site. But not many. Or rather, if that this is only way people believe they can access this book, then I am reducing the potential use of that book considerably. As a third point of comparison, I’ll repeat the same search with Google. 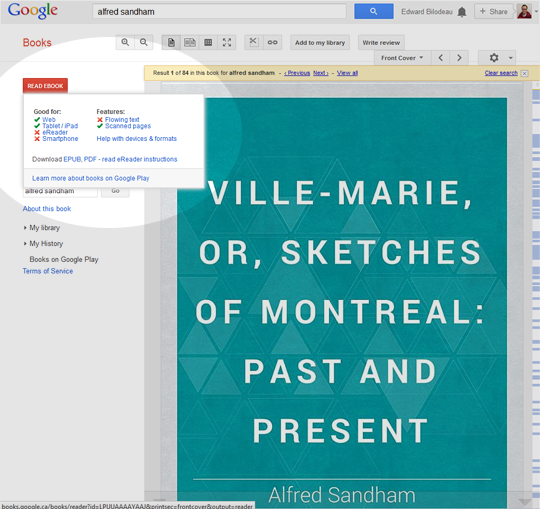 If I search for “alfred sandham”, I notice in the description of the third item in the search results the title of the book I am interested in (Ville-Marie). 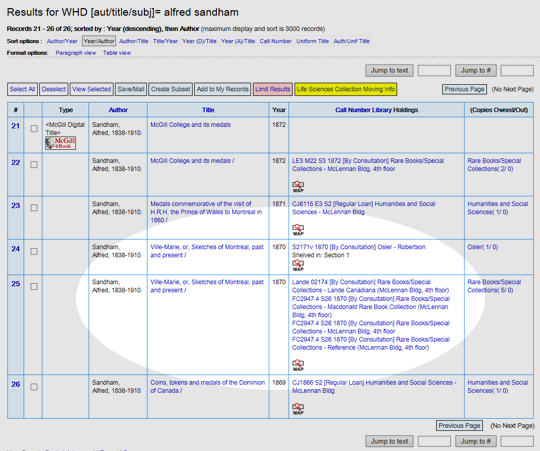 It is a link to the Internet Archive, which takes me to a list of books by Alfred Sandham. The second item in the list is the University of Michigan’s digitized copy of the text (which being in the Internet Archive has the extra bonus of being available in many formats including epub). So Google fares quite well in handling this search as well… I do wonder how well Google would work, though, with a restricted resource (i.e. something not freely available online or in electronic format). I think I’ll have to save that for a future post! In any case, for me last weekend, the ability to plug in the author’s name and within a few clicks be browsing an electronic version of the book I was interested in was certainly a positive user experience, and one that I wanted to share if only to provide an example of what is possible and what we are working towards. Note: I refer to WorldCat here but my comments could easily be in support of other discovery layers as well. WorldCat, like any system, has its limitations and problems, and like any library, we are constantly working to make things better.